Using a cast iron bottomed casserole dish or a frying pan with lid, add oil and heat on element. Add onion and sweat for 3 – 5 minutes until soft. Add the chilli, smoked paprika, cayenne pepper, ground cumin and ground ginger for 4 – 5 minutes. Add diced lamb, evenly brown for about 5 minutes. Add saffron to the Zespri Gold kiwifruit pulp and pour over lamb. Add enough stock so that the liquid just covers the lamb. Bring to the boil and cook uncovered for about 10 minutes. Cover with lid and transfer to oven. Bake for 1 hour. In a frying pan melt butter on medium to high heat. Add the diced Zespri Gold kiwifruit and cook until slightly caramelized. Remove Zespri Gold kiwifruit and set aside. In same frying pan cook the couscous as per packet instructions. Drain the chickpeas and add to the lamb, along with ¾ of the cooked Zespri Gold kiwifruit. Stir and bake for another 10 minutes. 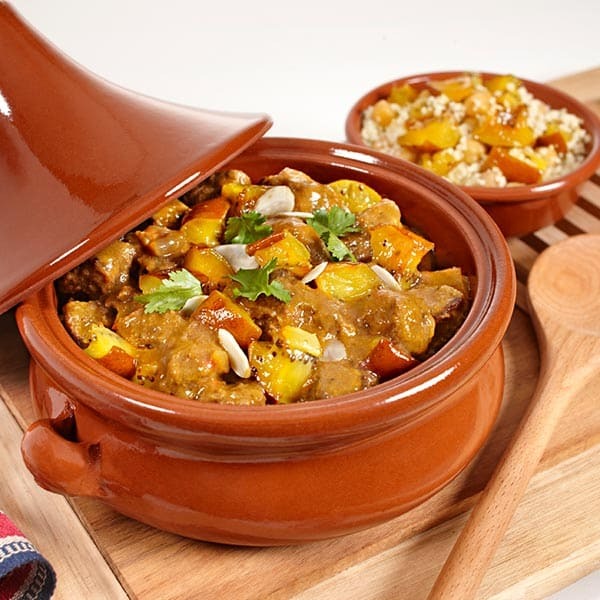 Serve by layering the Tagine over the couscous, and garnish with the remaining ¼ cooked Zespri Gold kiwifruit, chopped coriander and slivered almonds.